The CN7500 Series temperature and process controller's advanced control features can handle the most demanding temperature or process applications. Enclosed in a compact 1/32 DIN housing, the CN7500 has dual, 4-digit LED displays for local indication of process value and setpoint. Control methods include on/off, PID, autotune, and manual tune. 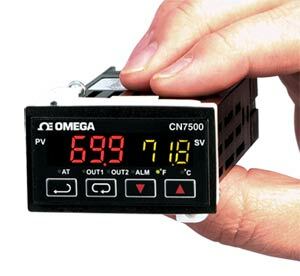 PID control is supported with 64 temperature and time (ramp/soak) control actions. The dual-loop output control allows simultaneous heating and cooling. The second output can be configured as an alarm mode using one of the 13 built-in alarm functions. RS485 communications is standard. Up to 247 communication addresses are available, with transmission speeds of 2400 to 38,400 bps. Other features include universal inputs, selectable temperature units (°C/°F), selectable resolution, quick sampling rate, and security protection. Noter: Comes with complete operator’s manual. Both the CN7-A and CN7-B software will work with this model.